As the healthcare industry continues its shift toward outcome-driven care and value-based payments, practice-payer collaboration is key to revenue cycle success. But with so many payment-related and regulatory concerns to account for – from PQRS reporting and incentive program requirements to weighing the benefits of joining an ACO – it’s important for every provider to ensure that patient satisfaction remains a top priority. Thankfully, however, the continuing digital transition across the healthcare ecosystem presents myriad opportunities for doctors and medical practice managers to better engage patients. And it’s important for providers to embrace the digital engagement opportunity: With more choice and transparency available to them, more and more individuals are feeling empowered to take control of their personal health… and if they’re not fully satisfied, that can often include switching doctors. In the new landscape of healthcare and medical billing, digital patient engagement impacts on medical practice revenue in three key ways: Choice, convenience, and care. According to Becker Hospital Review, 1 in 4 Americans has identified “choice” as a major concern in healthcare – specifically, that they desire having more choices when choosing a physician or healthcare provider. How easy does your practice make it for patients to find, and choose, you as a provider? Building out an online presence for your business, and promoting your practice through digital marketing, can help you access new patient populations and grow your revenue long-term. And over time, the more digitally connected your practice, the more competitive you’ll be among healthcare peers in your community. In today’s always-on, mobile-driven consumer landscape, patients expect as many convenient options as possible in each aspect of the healthcare experience. Paper-based processes and phone calls are no longer enough; in 2016, convenient means connected. From appointment booking and reminders to payments and follow-ups, the easier it is for patients to handle their responsibilities online (or even on their mobile device), the more likely it is that they’ll continue to stay engaged with your practice. Take a look at your processes when it comes to patient interaction and assess whether they’re as convenient digitally enabled as possible. Technology aside, satisfaction still starts and ends with patients’ overall experience in care delivery and outcomes. But with 61 percent of patients using mobile devices to access information about their medical conditions, it’s clear that care and digitally-optimized convenience are intertwined. 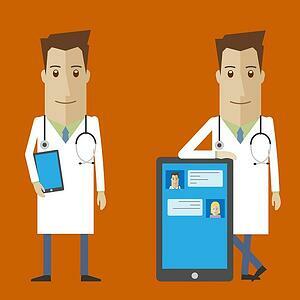 How easily can your patients handle their care and treatment concerns online? To keep patients digitally engaged, empowered, and paying, make sure their health records, medical billing options, and prescription information are easily accessible online. If they’re not, consider this your warning: Digital engagement will play a key role in your practice’s potential for growth in the years ahead (and it’s at your peril to keep your processes offline).